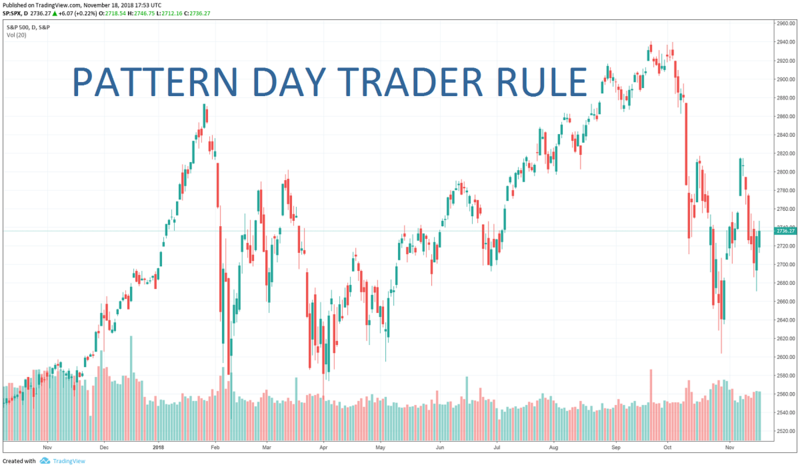 If you’re going to be a day trader, one of the most important things you need to understand in the stock market world is the pattern day trader rule. The pattern day trader rule can have a major effect on what happens in your trading account, and whether or not you can continue to trade for that matter. Keep in mind, that the pattern day trader rule is important for all day trading strategies. However, most swing trading strategies can be traded without triggering the pattern day trader rule. ​FINRA (Financial Industry Regulatory Authority) has been very aggressive when it comes to something known as the pattern day trader rule, which is defined in FINRA Rule 4210, as defined by having four or more round-trip day trades within five successive business days. ​If you have four of those within five business days, then you are thought of as violating FINRA Rule 4210, unless you have the correct amount of capital in your account. ​In other words, if you are trading stocks in the United States, and you both open and close a trade during the same session, that is considered to be a day trade. ​In order to day trade on a consistent basis, you need to have equity of at least $25,000 and a margin account. The required minimum equity needs to be in your account before any day trading activities. If you do find yourself afoul of this rule, you will be locked out of trading for 90 days. Ultimately, the brokerage firm can give you a pass on one violation, if you call them and they tend to be accommodating. However, the next time you do it, they will certainly lock you out as they can be fined for allowing this. ​So can I ever place a day trader with less than $25,000 in my account? ​Ultimately, you will eventually have a day trade pop-up. Even if you are not looking to do trade, there will come a point where you place a trade, and your stop loss gets hit before the end of the day. If that’s the case, then it’s likely that you will be okay, because you need to do this four times within five days. Most investors don’t have any concerns of doing that unless of course, you would have been extraordinarily long bad string of luck. Some traders will day trade even though they don’t have $25,000 in their account by simply keeping the count of their day trades on hand. This isn’t a suggested way to trade, but it is possible. The regulation states that brokers must freeze an investors account for 90 days if they can buy or sell roundtrips with a cash account as well that doesn’t involve margin but if they pay for a trade with unsettled funds. Ultimately, this essentially works out the same way and is also true for day trading penny stocks. Even though it is a bit restrictive, there are reasons for this regulation and restrictions on traders. Initially put into place on February 27, 2001, the SEC approved amendments to existing rules for margin requirements on day traders. The SEC sees this day trading with a lower amounts of trading capital as much riskier than typical buy-and-hold strategies. This is because they see investors with less than $25,000 in their account will be less sophisticated than those who have more money. There are quite a few complaints about this rule though, mainly due to the restrictiveness of the ability to day trade. ​There are also complaints that it is essentially a “poverty tax” on those who do not have $25,000 available. This is a rule that has had more than a few complaints, and although has been the law of the land for several years, there almost certainly will be adjustments made to it. For those who have the ability, they will often trade at proprietary trading shops, or use a CFD brokerage firm overseas that allows Americans to trade. However, that can be a very risky proposition in general. On one hand, there are various pros when it comes to this rule. ​The rule does protect small traders, and it can convince newer traders to take their time and learn how to trade before doing the riskier intraday trade systems. ​If you are only buying for longer-term trading, it does tend to protect your investments a bit, because over the longer-term investments do in fact typically rally. All one has to do is look at the stock markets over the last several decades to see this. ​It also forces traders to slow down and perhaps think through the trades a little bit more intensely. In a sense, slowing down any potential day trading could cause a trader to think their way through a potential investment. ​​​In general, it is much easier to trade longer-term that it is short, and it’s very difficult to make money on short-term charts. The cons of this rule typically focus on the restriction of freedom for the trader. ​Ultimately, the $25,000 barrier is difficult for many people, and quite frankly it’s hard to discern why $25,000 is so important. ​Remember, most of these laws are lobbied for, and it’s hard to tell ultimately who this rule benefited. Once the tech bubble busted, a lot of day traders got wiped out, and the rule was drawn up in that aftermath. In the late 90s, many people overleveraged themselves in the stock market assuming that prices would only go higher.The rule does stop that from happening which of course is a benefit, but quite frankly people will find ways to blow up their trading accounts and other instruments. ​After all, you don’t have the situation in the futures markets, nor do you have the same situation in the currency markets. ​​In some ways, 1:4 leverage in the stock market was very minor considering that some Forex brokerages in the United States offer 1:50 leverage and other brokerages around the world can offer as much is 1:1000! Can you imagine the damage that can be done with that type of leverage? Mike goes long AT&T $17.27 on Monday at 9 AM. He sees the stock dropped precipitously and gets out at $15.96 at 11:30 AM during the same session. This counts as a day trade in the pattern day trader rule. Susan decides to short Facebook on Monday at 10:30 AM. News comes out that’s a very bullish for the stock, and Facebook finds itself up $10. Susan decides to close out the trade at 2:30 PM that same session, covering her short. This counts as a day trade. Raul has been long US Steel since Wednesday, and it is now Thursday. He decides to add to his portfolio by going long Nike. The market tanks due to some type of geopolitical concern and his stop loss gets hit in both stocks. The Nike trade ends up being a day trade, but the US Steel trade has been on for more than one session, meaning that he only has one day trade. Any of these three traders that make another day trade within the next four trading sessions will now have two day trades against them. However, by the time we get to five days later, the initial day trade gets wiped off the record. If you are planning on day trading in the United States, you will need at least $25,000 to do it effectively within your ​brokarage account. However, you can always try to get involved with a proprietary trading shop, which gives you the ability to trade with less capital. ​Quite often, most of the shops ask for a good faith deposit that is required by the SEC to be locked up for a year. However, it gives you the ability to trade more shares than you could on your own. ​Using leading-edge technology tools like Trade Ideas does only make sense, if you have more than 25,000 trading capital or if you trade with a fundet account or at a proprietary trading shop. ​Some people will choose to trade futures markets instead of the stock markets because of this rule, perhaps trading the ES (E-mini S&P 500) instead of the SPY as an example. Various countries will have other types of restrictions, so, by all means, you should check into your local regulatory body for clarification.